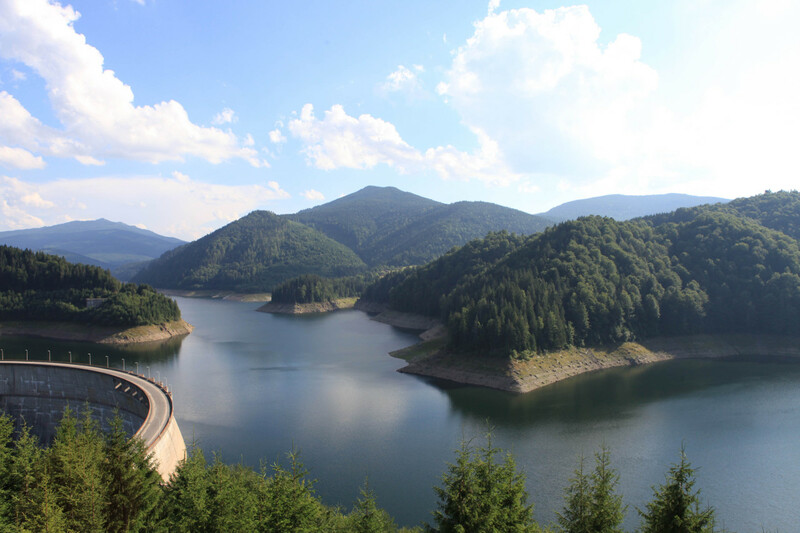 In a country that has been much maligned in some quarters, and by some politicians, Romania is, in fact, a beautiful country. 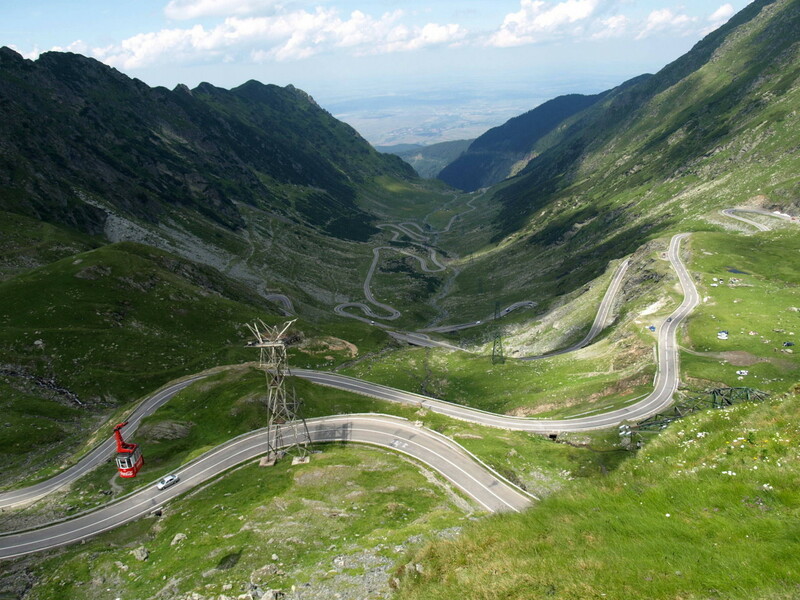 The scenery is breathtaking, the mountains fantastic, beautiful lakes, quaint villages, and – according to the equally-maligned Jeremy Clarkson, James May, and Richard Hammond of Top Gear fame – has the greatest driving road in the world, the Transfagarasan Highway! 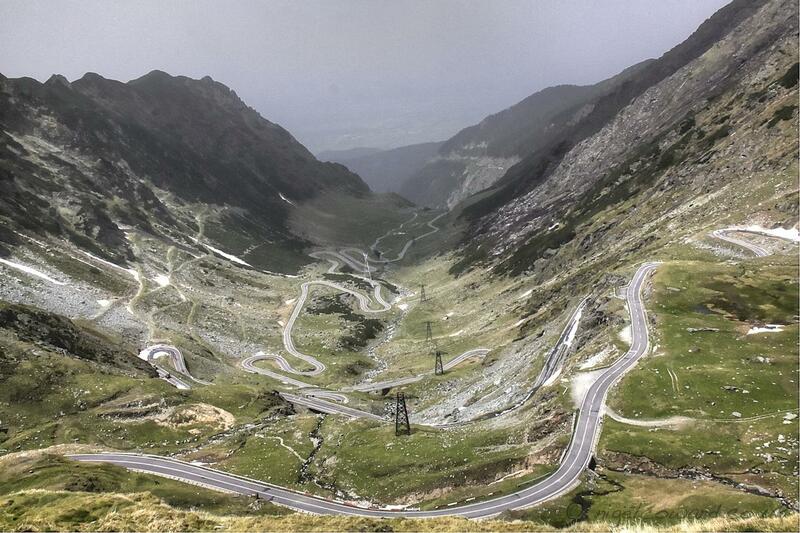 I’m sure if you drive it in supercars, like they did, that sit on the road like a train on tracks, it’s breathtaking…. 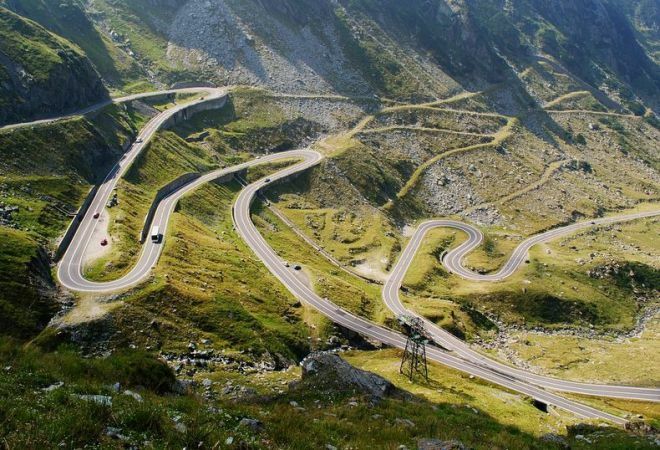 if you do it in an aging Fiat Panda with tyres about as wide as a bicycle’s tyres, which I did, it’s heart-stopping rather than breathtaking! 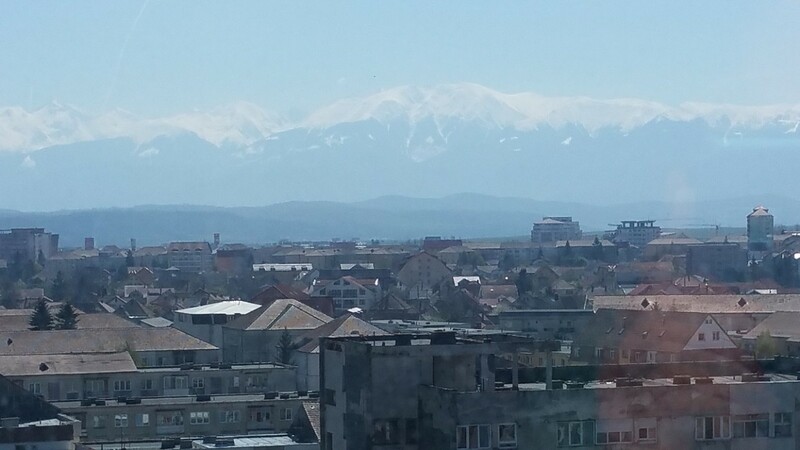 The view from my room today of the snow-capped mountains with a heat haze, overlooking Sibiu, is wonderful – (You have to ignore the ‘Ceausescu-built’ ugly tower block in the foreground!) 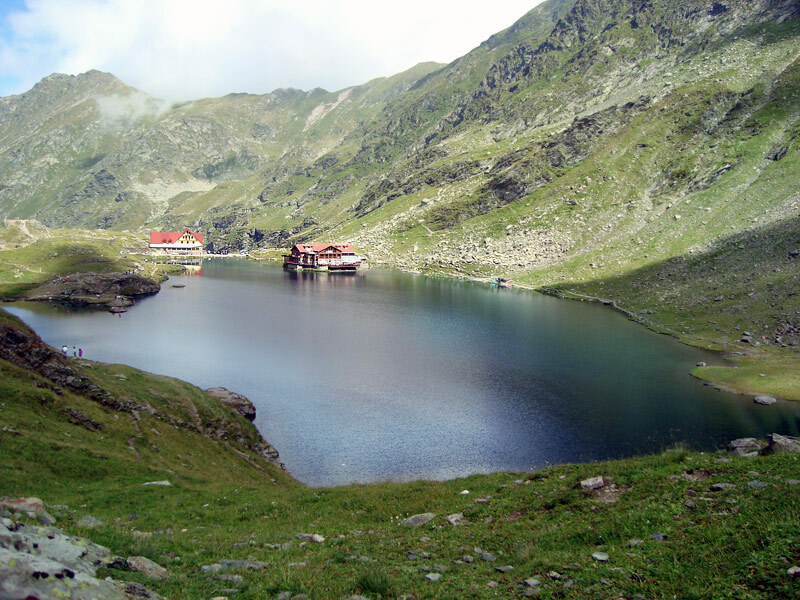 – and inspires ‘I will lift up my eyes unto the hills, from whence cometh my help?’… Transfagarasan Highway is quite close to the city… as is the lovely Balea Lac, which is just before going on the ‘theme park ride’ road… it’s a road that either does wonders for killing your fear of heights, or just compounds those fears! 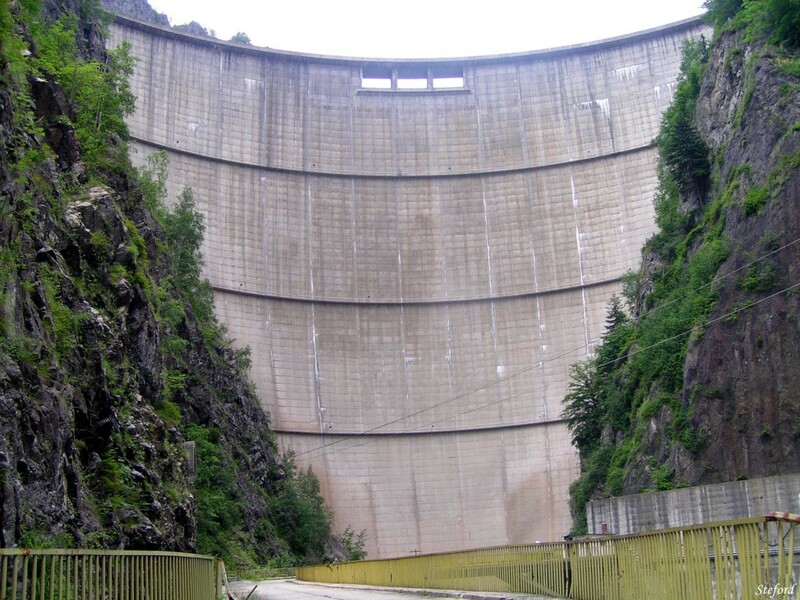 The Dam made famous in Top Gear! 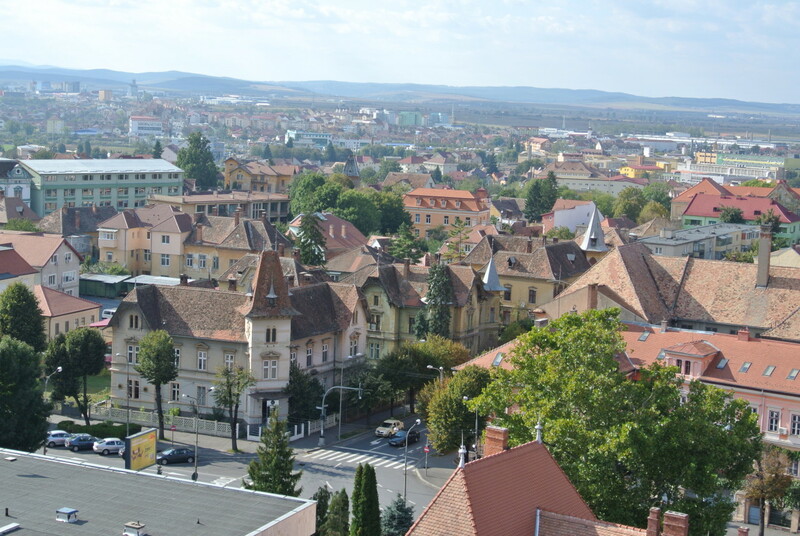 Sibiu, the lovely small (160,000+) Romanian city in Transylvania, high in the Carpathian Mountains, looks absolutely stunning on days like today. Very warm, clear blue sky, bright, hot sunshine, and, from my window here, a wonderful view of the mountains, some still with plenty of snow. I’m straight back involved with the folk from the last quarter of last year. Most of them are University students – makes me feel positively geriatric! – but there was a debate as to the existence of God, no doubt inspired by Easter. I enjoy sitting listening to people talking themselves up blind alleys, and then telling some stories, which among some people are ‘clearly made-up’, talk about my own healing from childhood celiac disease (in curable, but manageable: healed in an era where ‘healing’ wasn’t even BREATHED in churches, when I was about 13. AND healing from my birth back problem – a hole in my spine that shouldn’t have been there – a ‘small spina-bifida of the neural arch’ I think the diagnosis was. In those days, I knew nothing about not receiving diagnoses and prognoses ‘ ‘pain for the rest of your life, probable scoliosis, spondylitis, etc’ – apparently the ‘hole’ was like a millimetre away from my being a full-blown spina bifida victim. 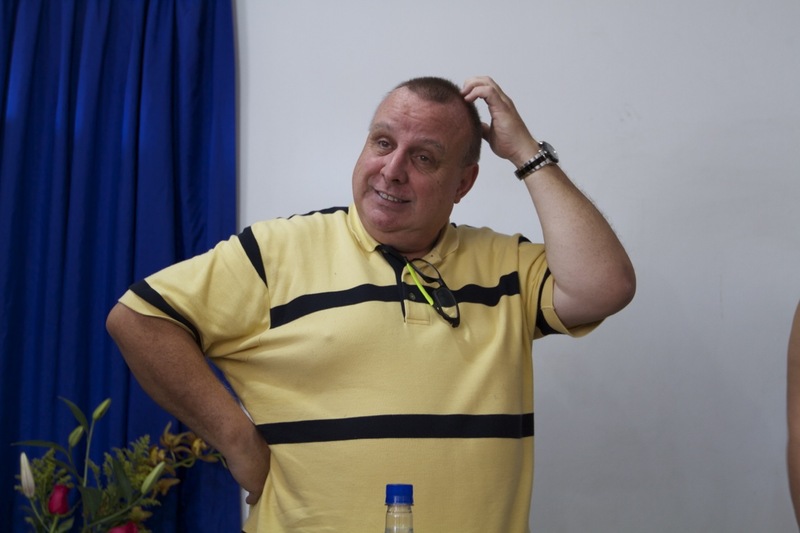 A lovely guy, then a real ground-breaking charismatic church-planter, George Tarleton – prayed for me. It was the first time (mid 70’s) any of us had seen the ‘leg-lengthening’ so commonly seen today (of course, it’s mostly NOT the keg growing, but the back straightening itself out – no less a wonderful visual miracle!). End result after x-ray? No hole in my neural arch, though by now it had been there for 20+ years! It’s hard to argue against personal testimony, where it can be much easier for people to think I make this stuff up! I’m really not that creative! 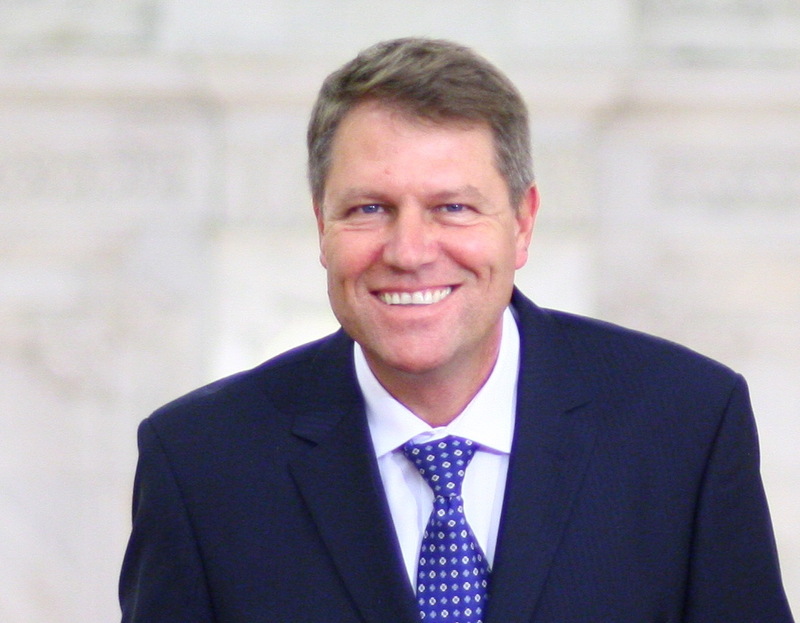 So the reason I love to get a number of 2-3 minute – or less- video clips of people telling their own story, is that it is much harder to contest… It was about 2 hours, then questions – and though I say so myself, it was generally concurred that the Brit – with the testimonies of Jesus – had won the day!! I do love this beleaguered country. It, like Colombia, has burned deep into my spirit: so, so different to each other, but equally precious in God’s sight, and are both on the top of my ‘Ask of me and I WILL give you the nations as your inheritance’ in my goals, dreams, and visions…. Much of what I do here is student-based: therefore much more low-key than Cali, but no less important in seeing souls drawn by the relentless love of God. 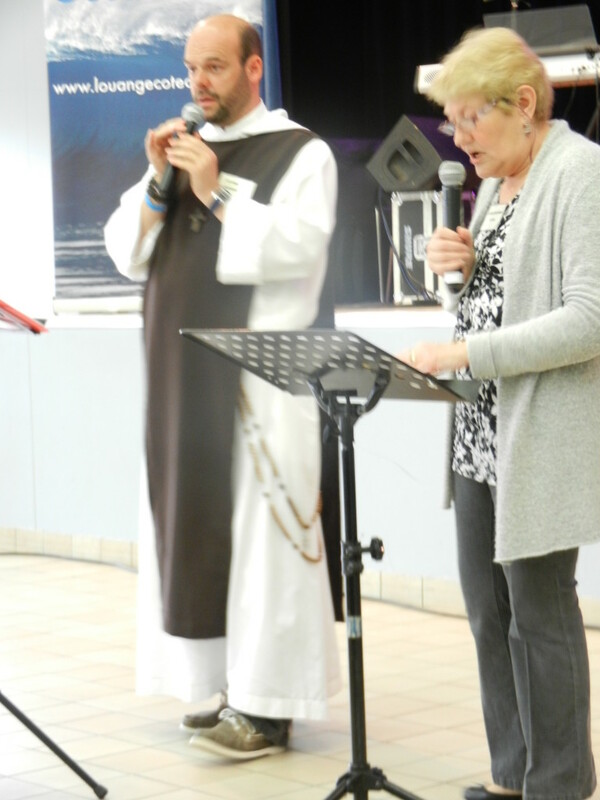 Louange Côte Ouest – West Coast Praise – is a lovely conference, on the beautiful Vendee coast of western France. I’ve had the privilege of speaking at the last two, and I’m delighted that organisers, Colin and Sue Enticknap, have invited me again for the event this year, May 15-17. PDF’s of the conference brochure are attached to this post. They speak for themselves, but Colin and Sue, who have been missionaries there for (I think) 8 years, are doing a sterling job of bringing revival to a beautiful place (to look at) but a very dry place, spiritually. 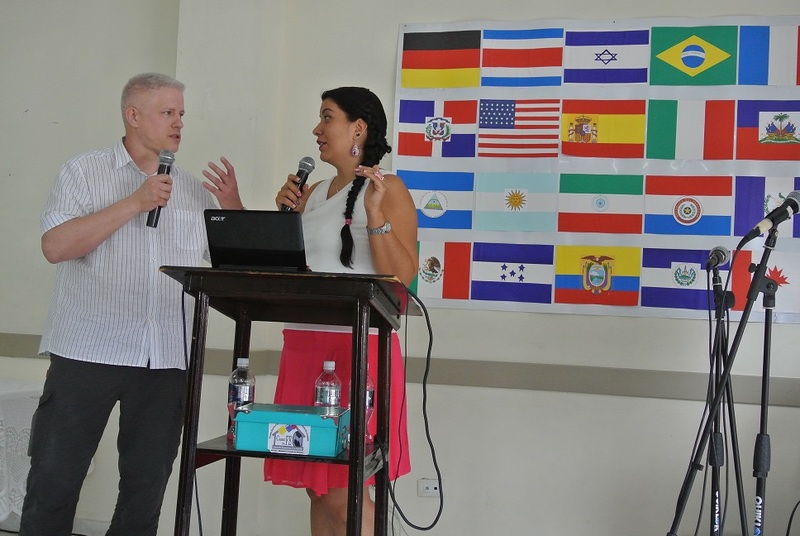 They have wonderful links with a fantastic community of Charismatic Catholics, a well as bringing together the scattered charismatic Christians in the region. There have been people saved, finding faith in God, having their faith levels raised, and some lovely healings in recent years, including a man totally deaf in one ear getting his hearing. It’s a wonderfully relaxed conference, but the Presence of God is there in a powerful way, and the Holy Spirit touches everyone’s lives. It’s fantastic to see, last year, a monk from the Catholic Community dancing wildly in the worship, his habit getting thrown all over the place as he swept across the floor in his trainers! Jean-Marie and I have become good friends ove the past couple of years or so, and his hugs are well worth going to the conference for! If you want to go, it’s not too late: it’s pretty easy to get to, too: Flybe and Easyjet both fly to Nantes, which is within shouting distance (quite a LOUD shout, I ought to add!). Ferries to Cherbourg, Caen, and Dieppe also make it accessible if you want to drive. If you’re thinking ‘Oo-er, but these weekends are so expensive’ then let me tell you it’s 35 euros per adult, 10 euros 13-18 years old, under 13’s free! Last Sunday afternoon, theoretically our ‘last’ engagement in Cali (though in an earlier blog, ‘Right to the Wire’, that doesn’t mean it actually WAS our last engagement!! ), intrepid Paul went ‘solo’ to Reconocer: Brian was unwell (ironic enemy attack on hat was ostensibly a ‘healing’ trip! – same goes for my knees which prevented me from going!). Generally we see just the residents going through the reahab programme, but as you’ll see in Paul’s report, I rather ‘dropped him in it’ unknowingly(! ), and what would normally have been a 90 minute meeting, turned into well over 3 hours! As Paul (with me) had just got home from a 6 hour morning meeting, he was a saint, but God blesses saints when they stride into action, whatever, and however tired they are! Spoke on being a new creation and being filled with the Holy Spirit. The centred was packed with drug rehab residents and their families up to the back wall! During the message some of the parents started weeping, while others had a look of shock on their faces. The Spirit of revelation was present! After the message, an invitation to encounter God and receive more of the Spirit was given. 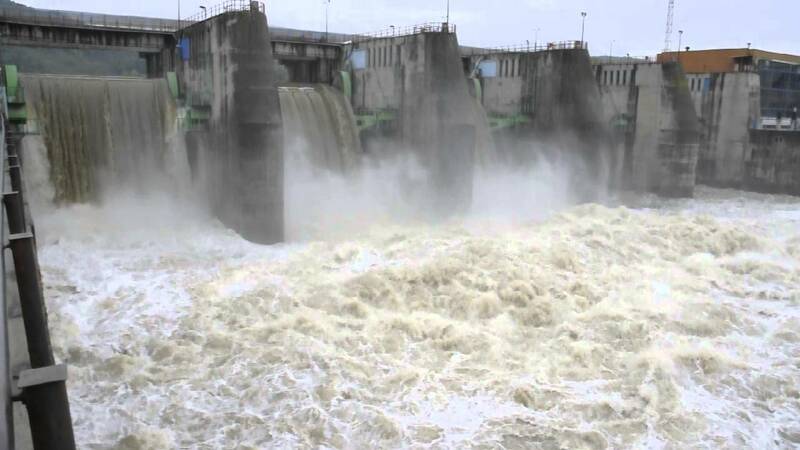 The Spirit started to come on individuals, who were already weeping – mostly the parents! Some received the love of God, others peace, others joy! One mother said she felt like a Typhoon was around her! Many smiles from rehab residents. An opportunity for testimonies was given and about 6-8 people came to the mic to shared what happened to them. People came forward for healing, not many, but they were all healed, including the Centre leader who had a 90% sight loss in one eye, now able to read what’s on the back wall! One young man came forward for prayer due to struggles with his relationship with God. He shared he once made oaths to Satan before he was a Christian. He was taken through a process of renouncing his past activity, etc. When the Holy Spirit was invited on him, there was a demonic manifestation that spoke saying “you can’t have him”. This was promptly told to be silent and leave, which it did after a short battle. The man was filled with peace and anxiety lifted. As the ministry continued with others, he became the more joyful as the meeting went on! Some parents received prayer and also rehab residents still struggling with various things. The ‘new man’ message brought heart revelation to a number of them and freedom and joy was in the atmosphere. Many hugs and some photos. In all a 2hr session and a great end to a wonderful week of seeing God heal and transform people. You may recall the story of ‘Reconocer’ as being just about the ‘ultimate’ redemption of a property imaginable. For decades, the major ‘drug war’ in Colombia was between the Medellin cartel (Pablo Escobar) and the Cali cartel (the Rodriguez brothers). It was a mega-billion dollar war, and a mega-thousands loss of life. Escobar was killed in 1994 (I think), and finally the Rodriguez brothers were extradited to the USA about 7-8 years ago. ‘Reconocer’ was one of the main ‘inner city’ houses owned BY the Rodriguez brothers – a centre for cocaine, many other drugs, guns, ammunition – you name it. 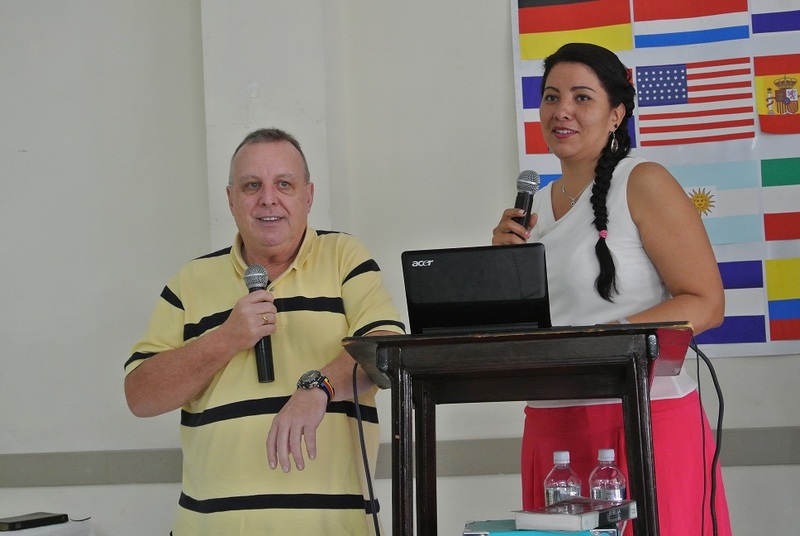 NOW – redeemed by the Lord, it is the centre for drug rehabilitation run by the wonderful Enrique Leal, such a dear friend, and incredible man of God. It’s a wonderful story. So, sitting here in the Avianca Airlines lounge in Bogota El Dorado Airport, with a 5 hour wait here between landing from Cali and taking off for London, the ‘ministry’ aspect of such a trip as this one has been almost seems a distant memory… there’s fantastic blessing in being on a trip like this – on all my trips, in fact: I’m so grateful that God allows me to do this – but the ‘downside’ is this bit, and then the next bit! 5 hours here, 12 hours in the plane to London, 3-4 hours in Heathrow Airport tomorrow once we land from Bogota, and then the 50 minute flight (but 90 minutes on the plane) to Belfast. The tiredness after a whole day flying and waiting can only be understood and empathised with by people who have done it! (though the far east, Australia, etc., are even worse!). At least it seems that there are some good films on the flight home, though some are a bit ‘aged’ now (The Bucket List, for instance, though a fantastic film). Sleep and I (and many others, it seems) are not good ‘partners’ on a plane, which makes an 11-12 hour flight seem endless. Please Lord, some sleep tonight, after a good film would be wonderful. Who knows who else? Four years ago, the lovely Chris Spark came here with me, probably thinking it was a ‘one-off’ trip. Many miracles later, he came the next year. Many more miracles later, he came last year. And, guess what? He was here this year – saying it was the best so far… Paul is already talking about coming back, Brian IS back for the second time, bot will come again, I’m pretty sure of that. I remember hearing my early ‘real christian’ life mentor, Clive Calver, say: ‘If you want to get involved in what God is doing, find out where he’s doing it, then go there, and get on with it’. That’s been my ‘ethos’ for years. This IS a special country: Cali IS a very special city. Maybe it’s something to do with 50+ years of civil war, 50+ years of being derided by most nations for the cartels, the cocaine, the murders, the violence: because of that, God chooses to bless some of the loveliest people on the earth, at least in my experience of different peoples and cultures. And the BEST IS STILL YET TO COME…..
Olga WILL walk: I felt (as I have before) that I’d done ‘my’ bit, and had to get out of God’s way before the miracle… her son, Alan, was asleep when we were there, so no way of knowing what happened – YET: the aunts both healed instantly. …and so sad that today is our last day of meetings here in Cali. 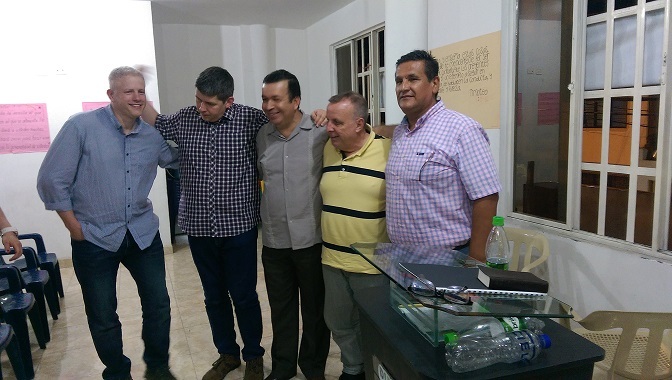 Miracles galore – blind eyes opening, completely crippled walking, pain became history for many… Brian had especially asked to go to Wilmar’s church, Mision El Abrigo Internacionale, and he had the advantage of not being picked up for church until 9 am. I was envious, as Paul and I had to get up at 6.30 for an 8 am meeting quite a long drive away 🙁 But wow, was it worth it! How do I write about this morning? A church in the north of the city, barrio Oriente: Mision Mana/de Alcance a las naciones (reaching the nations): a new church to me, pastored by a lovely couple, Juan Carlos and Luz Estella… to say that the Presence of the Lord was there would be a gross understatement. Both Paul & I spoke: again, I felt that Paul, in his first visit here, and having relaxed so much into preaching, should take the lion’s share, and again, he spoke really, really well. I love so much giving the people who come with me, the opportunity to do a lot of what they might not get the opportunity to do back home. The offer to pray for people brought a ‘tsunami-like’ effect from the quite big congregation. Not only that, but really – REALLY – sick people had been brought from their homes, and wheelchairs, zimmer frames, and walking sticks, were much in evidence. I began with a lovely guy in a wheelchair: Jhon, 43 years old, massive brain tumour 3½ years ago, paralysed left hand side, unable to speak. There was significant change in his face, more strength in his hands, hope had returned. I’d love to tell you that he got up and walked, but he didn’t: I think that’s a little way down the line. Sufficient change to really bless and encourage his wife, who left with a very real peace on her. So the meeting was 6½ from start to finish, with both Paul and I praying solidly for people for almost four hours. It’s wonderful, it’s amazing, it’s a blessing – and it’s totally shattering, emotionally, physically, and spiritually. But what a way to (almost) end: Paul’s on his own right now, with Wilmar, at the wonderful drug rehab centre, Reconocer. I’ve already put down a deposit for the apartment here in July: and looking forward to having Peter, from Bangor, Northern Ireland, and his sister, Kerry, with me: maybe Lee, Katie, and their daughter (who’ll then be 11 months old): possibly/probably Margrethe from Norway… and I’ll see who God sends my way to firm up the team very soon! After a relatively ‘easy’ day – much needed – we were off to a church where, last July, many miracles happened: ‘Casa Berea’ in the city of Yumbo. Tonight was every bit as mind-blowing as last July! Only my second visit to the church, yet greeted like a long-lost friend when I arrived with Paul, Brian, and Diego. The Presence of God was there, and it’s not too difficult to preach in that sort of atmosphere. Initially, it was going to involve contributions from all of us. But as Brian shared – very well, I might add – I felt that I should just let him and Paul ‘run’ with the meeting. Paul again spoke really, really well. Many stood to ask God for a fresh infilling of the Holy Spirit, and people were healed as they prayed for each other, having had a touch from God. There were still hordes to pray for: apart from a very few things you can’t ‘see’ or know are healed – like cancer, diabetes, etc., – everyone was healed. Brian had a word from God about damaged hips: he saw 4 healed, I had two more. Multifarious pains went, Paul had someone – like Carly Brown, last year – healed of Parkinson’s disease, another lady with displaced discs in her back, who spent the next little while touching her toes! – I had a lovely elderly lady, Nina, crippled with arthritis, especially bad in her shoulders and hips, but with an excruciating problem that probably helped me make a decision I’d already made anyway! – she’d got arthritis in her left knee, but was in extreme pain in her right knee, where she’d had a knee replacement… in more pain now than at any time during her ‘arthritic’ right knee days. God took away ALL of her pain, including in the prosthetic knee. Seems a little pointless to me to have your knee replaced to have MORE pain than before, virtually all of the people I know who have had that surgery, have regretted it. More stories to follow tomorrow, when I get the guys to remind me what they saw God do! And a 6.30 am start for church in the morning for Paul and me… 🙁 – God, wake us up fresh, and rarin to go, please! !